We invite you to come to AIM HIGHER to meet our management team, our staff team, and the clients who have already chosen our program. All of us can speak with you about the value and quality your loved one will see and feel at AIM HIGHER. We will take the time to discuss with you the areas that are most important to you and how we will integrate those areas into the daily programming. If you have goals and objectives that you want to carry over from school or another program we will show you how we will incorporate them in to the Individual Service Plan. But most important, you will be able to see for yourself that at AIM HIGHER we are all about providing the highest quality program through a safe and innovative environment that treats every client as an adult and an individual first. Isn’t that what really matters most? How can you set up a tour? We understand that choosing the right program can take time and that you may need to visit us multiple times. We welcome your visits anytime. We will do whatever we can to ensure that you are 100% comfortable with your decision to help your client transition into AIM HIGHER. When you and your loved one decide to join AIM HIGHER, the process to get enrolled and start attending is very simple. Get ready for a wonderful experience! Once everything is in place to begin attending the AIM HIGHER program we will meet to discuss initial goals and expectations. We will meet again after he/she has been attending for 45 days. After that we can/will meet a minimum of once a year and up to once a quarter if that is what we all agree is best for the client. 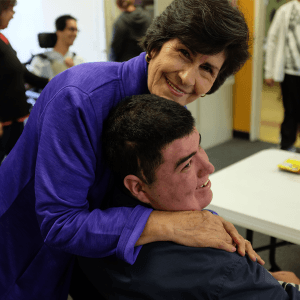 Our meetings will be centered on the Individual Service Plan that connects specific goals to the Fabulous Five components, along with other areas of interest and any special needs. No matter what – communication will be constant and clear. There is no other way!